Late autumn and winter is probably the only part of the year that’s pleasant for hiking in the otherwise very hot and dry Southern California. And it’s worth taking advantage of the pleasant winter temperatures because the Southern part of California offers quite some special landscapes. Just a side note to those not so familiar with the weather in California: it’s sunny. One of the best things about planning our hikes there was that we don’t even need to think of the “What if it rains?” scenario. It especially applies to Southern California that is the hottest, driest region. 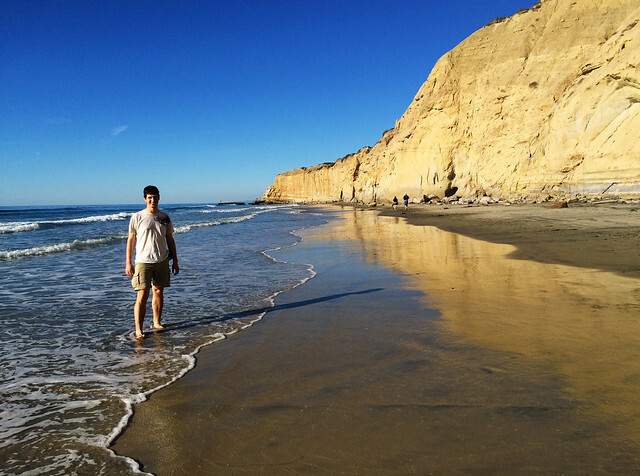 Average temperature in San Diego is 9-18°C (49-65°F) throughout the winter months. We hiked in shorts and T-shirts in winter, too. 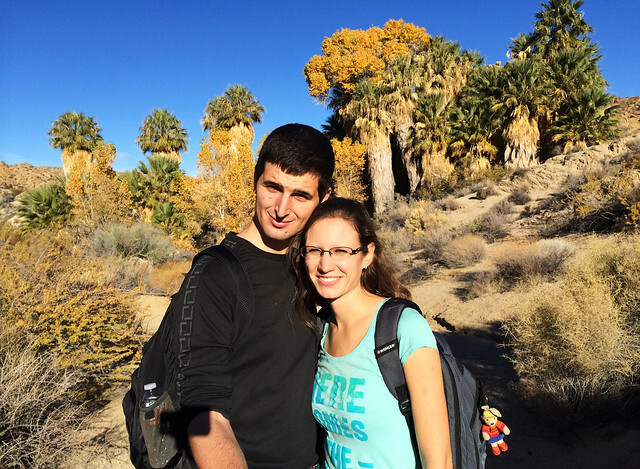 I even got a light heat stroke when hiking in the desert near Palm Springs in November. So have enough water and sunscreen. The most spectacular place we’ve found in Southern California was the Indian Canyons in Agua Caliente, the land of Cahuilla Indians near Palm Springs. The area is open for day use for a small fee and it offers the loveliest palm canyons we’ve seen in California. 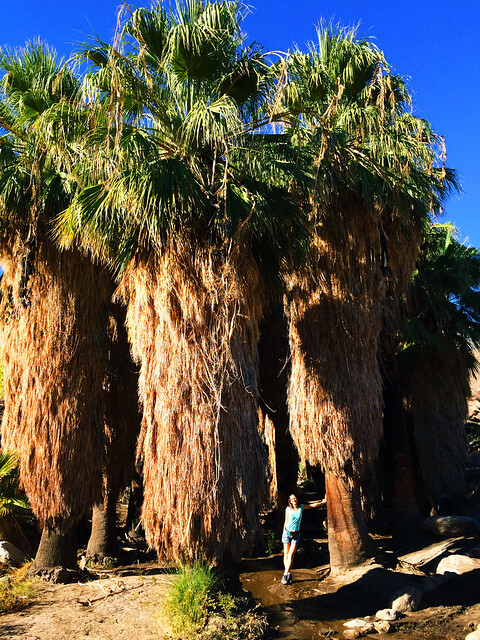 The shortest one is Andreas Canyon that is a nice walk along a small creek in the shade of the huge California fan palms. Murray Canyon starts from the same parking lot and it’s a bit longer trail ending at Seven Sisters Waterfall. The longest one is “The Palm Canyon” trail that was the prettiest during the first couple of miles when we hiked along the creek and under the huge palm trees. Later palm trees got replaced by different kind of cactuses and other strange, thorny, spiky plants we couldn’t even know by name. The fan palms grow in a narrow zone along the creeks so these canyons show you that tiny part of the desert that looks like paradise. Read more about our hikes in the Indian Canyons here! This reserve got its name after the endangered Torrey pine (Pinus torreyana). 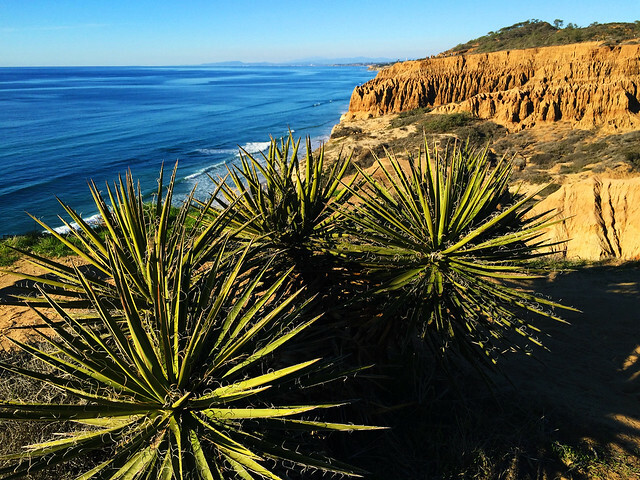 Though the greatest natural treasure here is this rare pine tree, it’s the high broken cliffs, deep ravines, stunning ocean views and Torrey Pines State Beach that make it one of our favorite coastal parks in California. 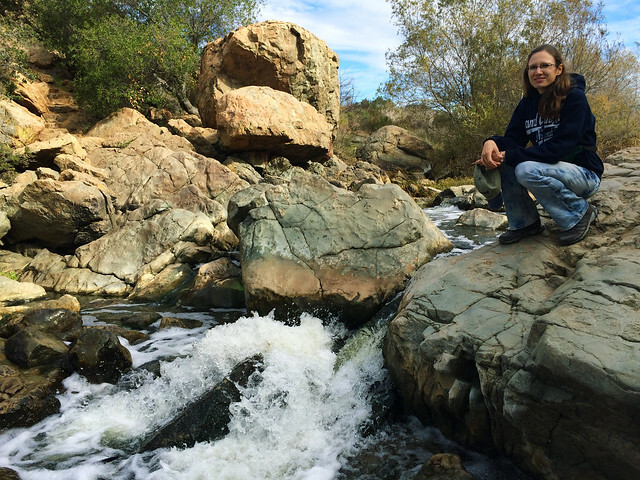 It’s not even 30 minutes drive from San Diego and several short hikes give access to its unique beauties and views. 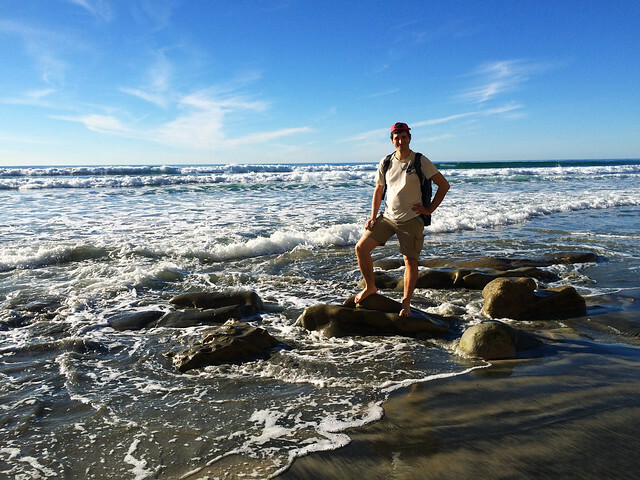 Our favorites were Razor Point Trail and Beach Trail that can be done together as a loop. 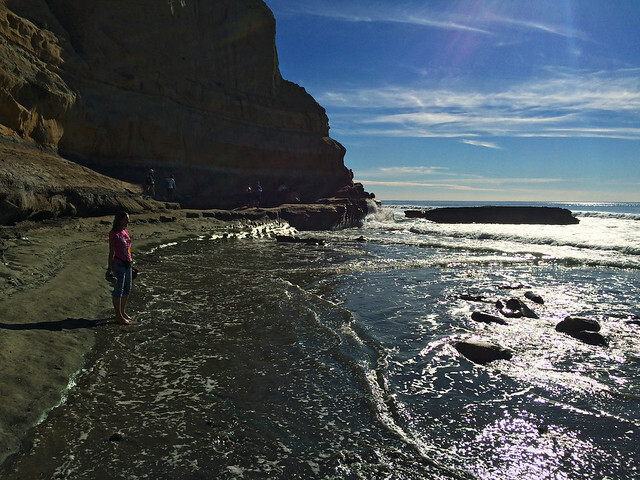 Beach Trail offers access to secluded areas of Torrey Pines State Beach in the end. This soft sandy beach with the sandstone wall rising above it is also a treasure of the park. High Point is a lookout that’s just a short walk from the parking lot and it offers a panoramic view of the reserve, the lagoon and the inland. 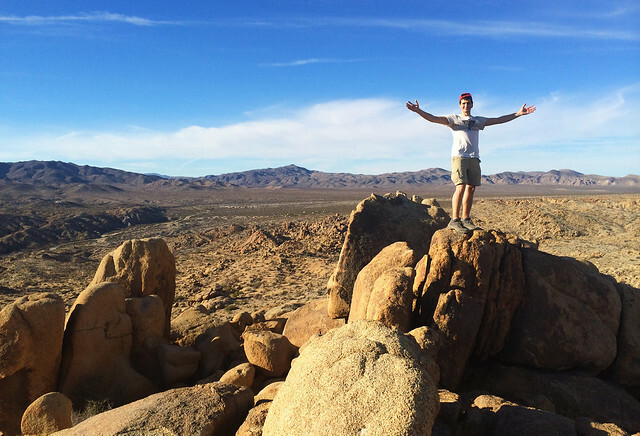 Joshua Tree National Park is at the meeting point of the Mojave and the Colorado deserts. This is a landscape sculpted by strong winds and occasional heavy rains. 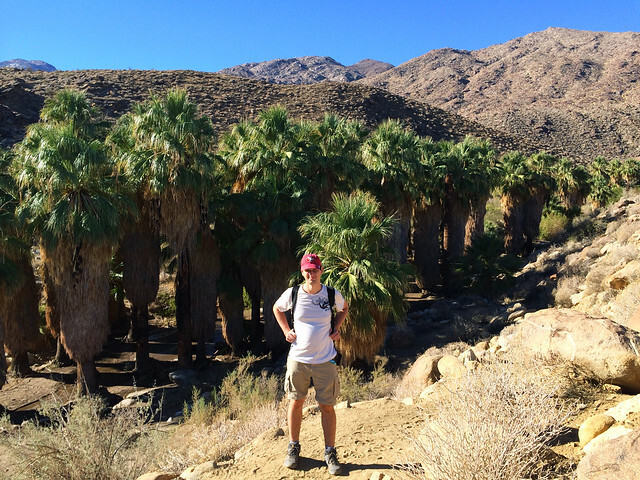 There are countless shorter and longer trails and we only had time for one: Fortynine Palms Oasis. We got views of the rocky landscape and ended at a palm oasis. We have to admit we enjoyed the Indian Canyons more than the palm oasis in Joshua Tree. But then, we saw such a tiny part of this national park. And there’s one thing we are very sorry we missed: stargazing at night. Joshua Tree is one of the best places for stargazing in the whole United States. It’s located 3000-5000 feet above sea level and far from major cities so you have a good chance to see unforgettable night skies. 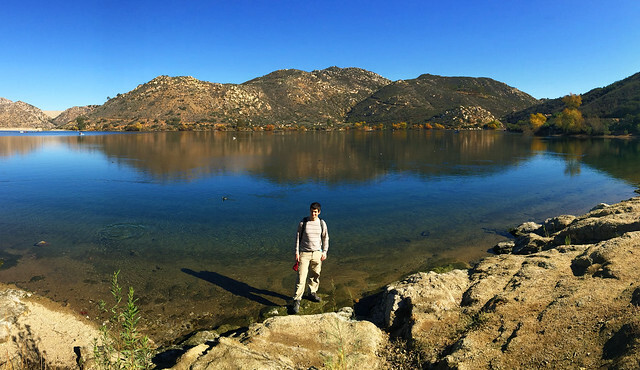 Lake Poway is 30 minutes drive from San Diego and it’s the trailhead for a nice panoramic hike in the desert-like mountains north of the city. The trail runs along the lakeshore in the beginning then it gets steeper and it leads through a rocky terrain to the summit. You can even see the ocean and San Diego below on a clear day. 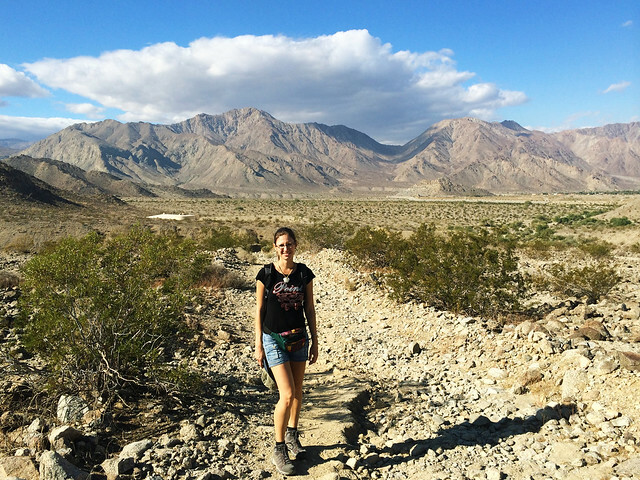 This desert and mountain park is close to Palm Springs and we explored some of its lovely, shorter hikes. 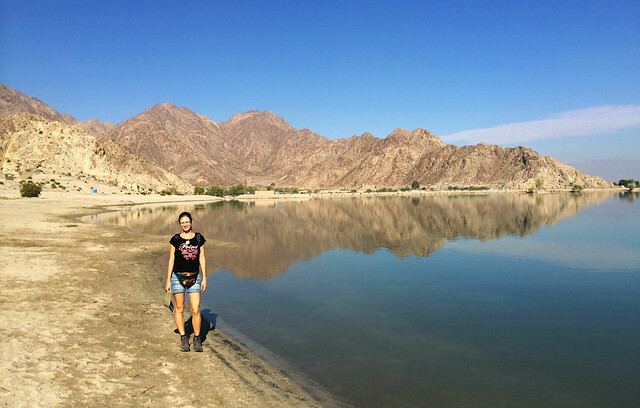 Our favorite was a short trail to Lake Cahuilla that’s a pleasant place to hang out in the remaining part of the day. Some smaller canyons can also be found nearby. The trail in Los Penasquitos Canyon is easy and mostly flat. It’s not about breathtaking panoramas but it’s a lovely and barely known walk that ends at a nice little waterfall. It’s located half an hour drive from San Diego and we did it in about 2 hours (there and back). San Diego was a great surprise to us. Balboa Park became one of our favorite urban parks in the world and San Diego stole our heart with its unique vibe and fabulous beaches. We even found two shorter hikes in the city that we liked very much. One of them is hiking to the top of Cowles Mountain. This 3 miles long, steep trail offers views of the whole city from above. We hiked to the top of Cowles Mountain in the morning and we had another hike planned for sunset: San Diego’s Sunset Cliffs Natural Park. This is a breathtaking walk along the rugged coastline and steep cliffs. And it offers great sunset views, obviously. We could also climb down to some of the beaches on the way. 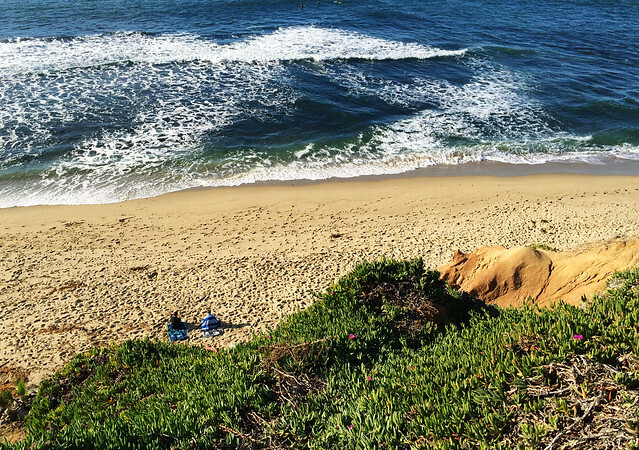 We created this list based on what we’ve seen in Southern California, but there are quite some places we didn’t have time to visit – or that we don’t even know about. We were sorry to miss the Salton Sea State Recreation Area and the Salvation Mountain because they also seem to offer some amazing sights. Do you have anything to add to our list? Please share it in the comments! 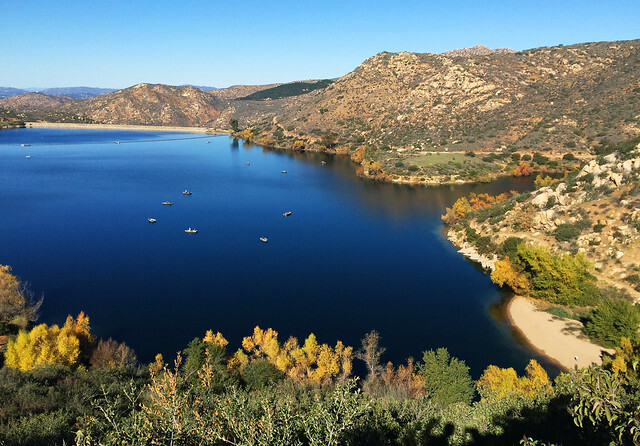 We’ve written a series to show you our favorite California hikes for all the seasons. You can get ideas for the best early spring, late spring, summer, autumn and winter hikes. This is a nice hiking trail you two picked. And those palm trees, I never saw them before. Thanks for a nice post. Thanks for reading us 🙂 Cheers! Have you done any overnight backpacking trips in winter? If so, I’d love some suggestions. Thanks! Hey, Jeff. Nah, we mostly do day hikes and book a room with a bath for the night 😀 Sorry, we couldn’t help in overnight backpacking ideas. But if you check the official page of the parks, you might find some recommended routes there.